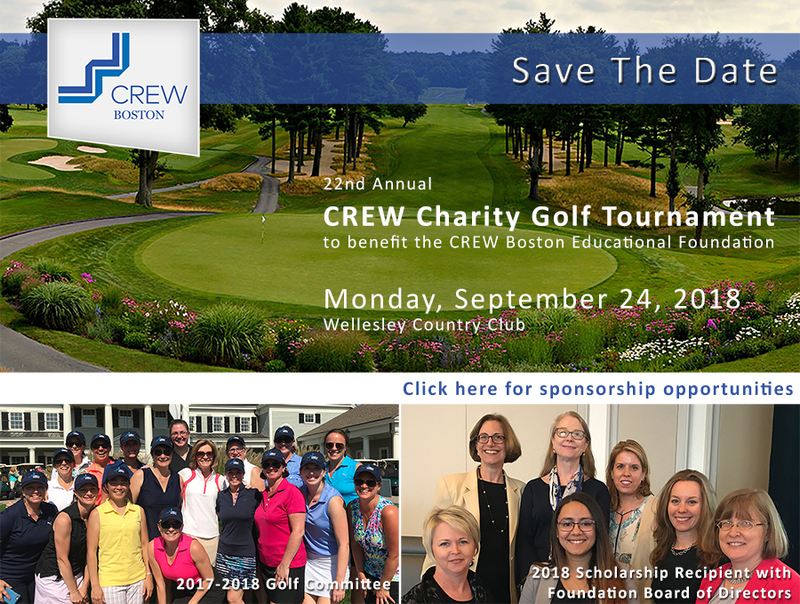 Mark your calendar - CREW Boston's Charity Golf Tournament to benefit the CREW Boston Educational Foundation will be held on Monday, September 24, 2018. The purpose of the tournament is not only to enjoy a day on the golf course and to network with other real estate professionals, but also to support the CREW Boston Educational Foundation, Inc. The CREW Boston Educational Foundation, Inc., a 501 (c) (3), is an endowed fund that supports the CREW Boston Educational Foundation Scholarship (Scholarship). The Scholarship will be awarded to one or more female junior, senior or graduate students at one or more accredited colleges or universities based in New England. Qualified students must demonstrate, through her course studies as well as any jobs or internships with a commercial real estate firm, an interest in pursuing a career in commercial real estate. All from the CREW Boston Annual Charity Golf Tournament will benefit the foundation to support its mission. Registration will open in late June but sponsorship opportunities are available now. Click here for more information.